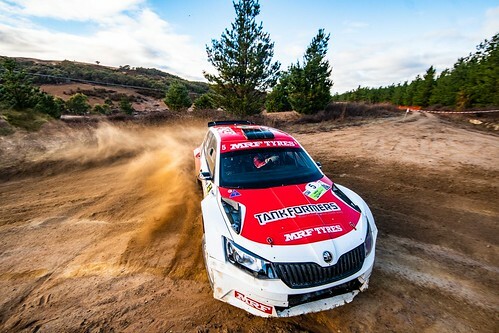 Evans and Searcy took outright honours at the 2018 Netier National Capital Rally , claiming maximum points as the fastest crew on leg one and for the outright win, also grabbing the bonus point for the most stage wins. Harry Bates and John McCarthy were the only team to stand in the way of a clean sweep for Evans and Searcy, winning the leg two battle by just 10 seconds and grabbing the 20 points. Glenney, Bates and Taylor remain in second, third and fourth respectively but it was Adrian Coppin that was the big winner of the weekend. His second place podium finish saw him move from eighth to fifth in the standings.